Have you been searching for a company that is able to carry out carpet cleaning in Glenrothes? With 22 years of experience in the industry behind us, you can trust A to Z Cleaning Services to provide you with a first class service at all times. We are based in Burntisland offer our services to domestic and commercial clients across Fife. 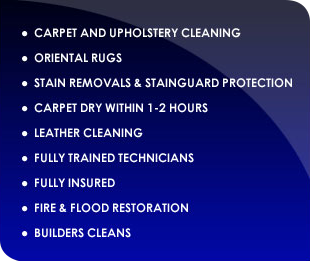 We provide both carpet and upholstery cleaning services and are also a quality leather cleaning specialist. Please see our services for more information on how we can help you. We are fully insured and our carpets are dry within 1 - 2 hours, making us ideal if you need to gain the use of your rooms as quickly as possible. Satisfaction is guaranteed as our trained technicians provide an excellent standard of cleaning, which offers value for money. Get in touch with A to Z Cleaning Services today if you have been searching for upholstery cleaners in Fife. We are sure that you will not be disappointed with the quality of our services, so get in touch with us for a friendly, professional, value for money quotation on 01592 874245 or 07778 768018. Alternatively, you can also get in contact with us by sending an email to info@carpetcleanerinfife.co.uk or by filling in the contact form with your details and query. Don't forget to come to A to Z Cleaning Services when you want the services of professional carpet cleaners in Fife.